To trace the origin of the brooch, from the Stone Age, the ancients will be in the body of the animal skins or simple fabric, and then you need to use a sharp animal bones or fish thorns to their own shelter, pins with the earliest form of these are used as a fixed thing, in the gradual development, the lapel pins not only have more beautiful shape, but also more important significance. For example, government, hospital, company lapel pins, personalized pins of family, and so on. 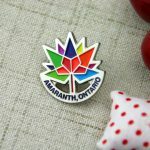 So many people need lapel pins more than before. Like the love of the pins, I believe that everyone on the brooch manufacturing process is certainly very interested in it! Please let me give you a detailed introduction. Perfect design is the soul of the product, we will design drawings according to customer requirements. The customer confirmed design drawings which are forwarded to the factory mold department programmer. After the 3D model is finished, the production of the badge can be said to really start. A piece of black steel, a mold material, fixed in the engraving machine, the computer program will be compiled according to the 3D model in the black steel, and remove the excess metal parts. Patterns are gradually formed, which is a slow process, different sizes, different complexity of the design, engraving time spent is not the same, short only a few hours, long or even take a few days to complete mold making. Mold is completed, our staff need to carefully compare the just good mold pattern with the design drawings to ensure that the mold pattern is correct. Just good mold and cannot be used immediately, we need to put the mold into the high temperature oven to bake, this is a simple heat treatment process, high temperature makes the carbon content of steel blocks to reduce the hardness of the mold, a mold Will be hundreds of thousands of tons of power thousands of times the impact, so the hardness of the mold is very important. 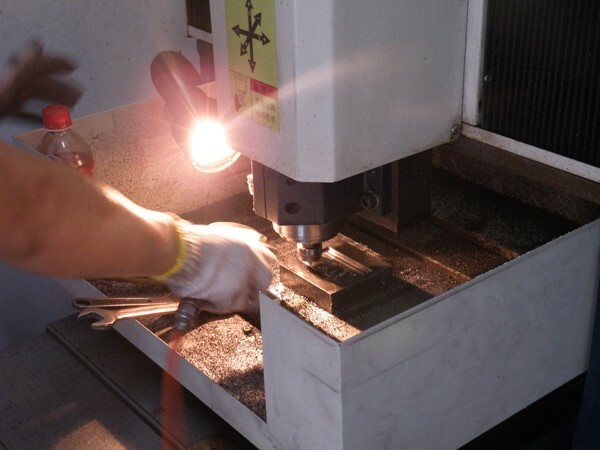 Finally, we put it immediately into the oil to cool, to further increase the hardness and toughness of the mold. Cooling the mold outside we will also set a steel ring, which is to protect the mold, to prevent the mold to damage in the stamping process. Hydraulic machine fixed on the mold, the following we can start the embryo. This process is what we call DIE STRUCK. The material selected for the embryo is iron, copper, zinc alloy, aluminum and so on. The first blank came out. We need to carefully check the blank design and design is not the same, there is a little flaw, need to modify the mold or even re-engraved new mold. Check done, if there is no problem, and then we will product massively. After mass production, we need to remove the extra part with knife installed on machine. 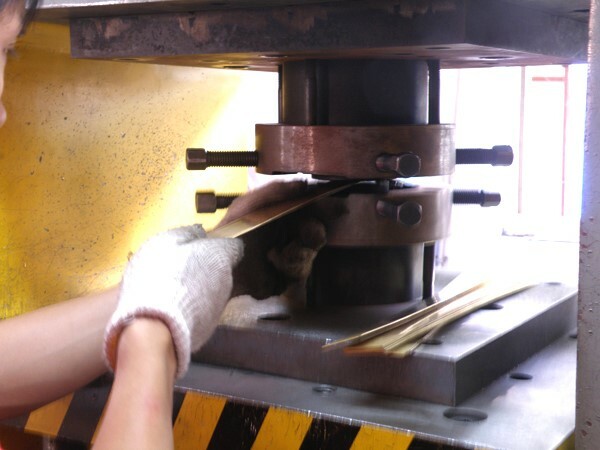 In order to the blanks becoming smoothly, we put all blanks in to grinding machine. Shock will cause the individual blanks to start collision and friction each other in the process of rough edges of some small burrs are shocked, polished. 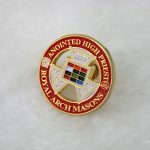 There are so many specific names for badge, lapel pins, cufflinks, a hat clip, etc., Different accessories led to different purposes of the badge, so the names is different. We equipped our production with a very wide range of accessories, “thorn needle, butterfly clutch.” Thorn horses currently have two kinds of assembly methods to fix, one is to glue the thorn needle stuck in the back of the product, but this way because of a long-time glue aging, resulting in thorn needle easy to fall off. And we are using another better way: silver welding. Welding thorn horseshoe needle is very strong, and it will not fall off and fix for so long time. Polishing is a very important part of the production process, I believe no one is willing to buy such productions which have rough badge and scratches on surface. We are responsible for every customer, so we are very strict for polishing. Polishing grinding wheel is divided into many kinds, there are hard sand wheel, soft cloth wheel and so on. If smooth requirements are not high, we can use the grinding sand wheel directly polished production, if customers want to get a smooth surface or mirror gloss, we need to use the cloth wheel to polish productions. 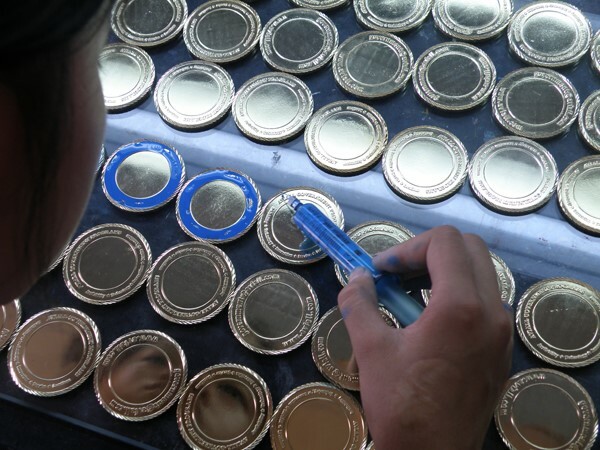 Each badge will be a separate polished, polished master carefully control the contact with the cloth wheel, to ensure that the polished surface can be just polished. After positive polishing, side polishing is still one by one were individually polished. 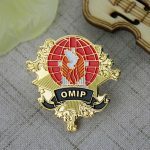 Polished badge to be sent to electroplating, according to the needs of the badge will be electroplated into a variety of plating, bright gold, bright silver, bright red copper, there are antique gold, antique silver, antique copper and so on. All kinds of plating have their own characteristics, according to the needs of customers will be plated a variety of plating. With the copper wire to the badge one by one string together, invading the syrup, the first step is to ultrasonic oil, this step is to remove the badge in the previous production process stained with a variety of oil, through the sound waves generated overclocking vibration, so that oil separate from the badge surface. To the end of the oil, invaded the sink, washed with water to the top of the badge above the syrup. And then, we start to plate, full of magic. Infiltration of alkali copper liquid, badges are coated with a layer of red copper at the end. In order to higher quality, repeating the progress, electroplating red copper is finished. Repeating the progress three times, plating silver is finished and four times for electroplating gold. Itis the real end of the plating When badges were sent into the oven baking. Color is divided into soft enamel and hard enamel. Soft enamel is one of our most popular styles. Metal areas are raised, colors are recessed. Hard enamel ‘s color is smooth and delicate, hard ware, giving a very upscale feeling. Contract color card and design draft, color master need to mix color. The pigment was sent to the color department. Because many places need to color is very small, the color workers inhaled the color with needle. After the color is completed, the quality inspection master carefully checked the badge color. If everything was no problem, the badge was pushed into the oven, high temperature baking made the paint color solid and fixed on the badge. The above is about soft enamel’s color, but hard enamel’s color order is not the same. Soft enamel need to electroplate at first, and then to color. Hard enamel is plating at first, coloring second, plating third. In other words, Hard enamel need to polish twice. In addition, after coloring, we need to deal with the problem of uneven color because the liquid properties before baking will cause the solidified color surface to be rugged. Products was sent to polish under the grinding stone down. There is water washing badges to prevent to be damaged for hot temperature. The last quality inspection was made before packaging, only qualified productions were sent anywhere in the world by land transport or air transport. We can provide different packaging according to different requirements for customers. Ziploc bag is most common. Besides, we provide paper card, velvet pouch, velvet box, plastic box. 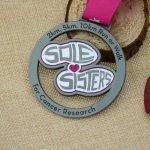 GS-JJ provides production including: Custom Lapel Pins, Custom Lanyards, Custom Baseball Trading Pins, Custom Medals, Custom Belt Buckles, Custom Challenge Coins, Custom Ornaments, Custom Embroidered Patches, Custom Keychains, Silicon Wristband and more. GS-JJ can give you the best production for you at the lowest price. I am done with first 3 steps, but I am stuck at fourth one (Grinding and vibration). Is there any way to have a chat session with you guys to conceive remaining steps?? Very detailed and informative article!! Thanks for sharing the easiest way to make enamel pins. I will definitely give it a try. Thank you! we can always help with any concern. Though I never ever ordered pins before but I am sure that you guys are very knowledgeable. Can you guys help me with my custom requirements? Yes we can help you, please can visit our website gs-jj.com or can write to us at info@gs-jj.com. Hoping to hear from you soon! Preparation of 3D models involves a lot effort and you defined the process really well. Looking forward to more blog posts from your side. 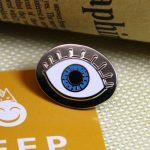 Do you guys sell Enamel Pins too?? I am interested to get some custom made pins. Please respond with quote. Hello Helena, yes we do make Enamel Pins. We can give you a quote with no problem, but because you are looking for customized one we will need to have some details. A quick quote to give you know will be $99 because that is our minimum order amount and you will have probably receive a lot of pins made. We don’t have minimum qty to place an order. Great pins! I have a question. I’m kind of confused on how to order them and send the design. If not, is there a way you can show me the steps through a video tutorial? Waiting for your response. 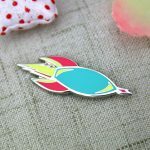 Please let me know the lowest amount of pins I can order? Actually, I need them as a sample. If the quality is good, we’ll definitely go for a big order. The pins look really great, the designs are exceptional, and the way you elaborated each step really inspired me. I love enamel pins but they are too expensive for me to buy them. I am sure, I will be able to create some following steps discussed in this blog. 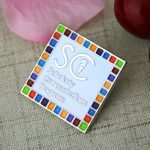 Please try us and you will see how affordable is to get your pins made with gs-jj.com. Hi thanks for this lovely post. 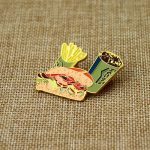 You have very practical convenient approach to create enamel pins. You are a gem! Thanks, this is exactly what I was looking for. I will definitely order loads of pins from you guys. I am more interested to learn how to make them because I can’t bear the cost. Thank you for helping us out! That’s lovely!!! Thank you! I’ve been looking for this information since long and always wanted to make pins like these!﻿ I am sure, now I will be able to make some.